Acronym for Search For Extraterrestrial Intelligence. The term SETI is used in reference to science projects that aim to locate extraterrestrial civilizations via some form of astronomical observation, usually in the radio frequency rage with the aid of radio telescopes. There have been several SETI projects. 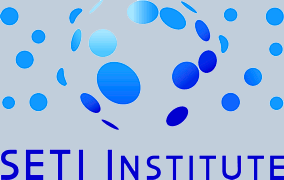 One of the best known SETI research groups is the SETI Institute ( logo left ). During the 1950s the two physicists, Philip Morrison and Giuseppe Cocconi struck upon the idea that extraterrestrial civilizations may be broadcasting radio signals. They published a paper in 1959 titled, "Searching For Interstellar Communications" in which they suggested listening for such signals at a frequency of 1420 MHz. This frequency was suggested because it represents a universal scientific understanding that any civilization capable of radio astronomy would be aware of, that being the knowledge that hydrogen, the most basic and common element in the known universe, has a natural emission of 1420 MHz. This frequency also falls within a range of wavelengths between 3Cm and 30Cm. Wavelengths of this size are less easily absorbed by planetary atmospheres or blocked by interstellar dust or drowned out by natural cosmic radio noise. Based on this knowledge, the first SETI programs began in the USA during the early 1960s. The first SETI program was Project Ozma. It was started in 1960 by Dr. Frank Drake. The project was named after the the Queen of the land of Oz, a fictional character from the classic stories by L. Frank Baum. From April to July 1960, for six hours a day, Dr. Drake listened for signals from Epsilon Eridani and Tau Ceti using the NRAO 27 meter radio telescope located near Green Bank, West Virginia, USA. As radio receiver technology advanced, it became possible to receive an ever increasing number of frequencies simultaneously. This enabled SETI scientists to increase their search capacity. However the data from these receivers was so enormous that computers became necessary to analyze it. This combination of multiband receivers and computers further evolved during the Internet revolution. In 1998 the SETI@home project began routing SETI data over the Internet to thousands of PCs in peoples homes. This resulted in a combined processing power rivaling to that of a supercomputer. Since the first search in 1960, there have been many SETI projects, however at the time this article was written, no conclusive evidence of extraterrestrial intelligence based upon SETI data has been found. Nevertheless, it seems reasonable that the search will eventually prove fruitful. An interesting spin-off of SETI efforts is the Team Encounter project, a commercial operation that sells "cosmic calls" to the general public. Broadcast from a 70 m (230 ft.) diameter dish in Evpatoriya, Ukraine, the Cosmic Calls transmit individual e-greetings as well as carefully developed, scientific information to selected Sun-like stars.